Nicholas Ray’s We Can’t Go Home Again begins with a homecoming, like The Lusty Men, where injured rodeo champion Jeff McCloud (Robert Mitchum) returns to the house he grew up in, only to realize that going home can be “like visiting a graveyard.” Jeff has withdrawn from the fray, like the violent cop played by Robert Ryan in On Dangerous Ground, who is sent to assist in a rural murder investigation to get him out of town, or the gunfighter hero of Johnny Guitar (Sterling Hayden), who has seen it all and has no illusions left when he rides up to Vienna’s Saloon at the beginning of the film. Life has surprises in store for all of them, and for the filmmaker, who becomes a Ray hero himself in this cinematic testament. Loss of innocence is punished by homelessness (vanished Eden), so in We Can’t Go Home Again the commune formed for the purpose of making the film becomes a substitute family, one of many that sprang up during that era for all sorts of reasons. This one has been called into existence by the filmmaker’s solitude and — although it isn’t said — by the intimations of mortality that have begun to haunt him. This new Ray hero is named Nick. In We Can’t Go Home Again, a film about the making of a film, we see scenes in which the great director of actors Nicholas Ray directed his students, invented from their own lives, and when Nick, his double, is onscreen we see him directing them, and they become fictitious too: Richie Bock and Leslie Levinson are not Richie and Leslie, the characters they play for Nick’s camera. Only the hundreds of hours of video- and audiotape archived by The Nicholas Ray Foundation, which do not appear in the film, are a documentary of Nicholas Ray teaching. What we see in We Can’t Go Home Again is a story in which the character of Nick is shown teaching his art by practicing it with his student actors, who play versions of themselves. It is an ars poetica; being a Nicholas Ray film, it is also a critique of the artist. As the scenes we see in the film took shape, Ray helped his young actors overcome inner barriers against expression using techniques learned in the course of a life dedicated to hunting and confronting the unknown “other.” The Stanislavski Method was the most important of the techniques he had learned for doing this, but not the only one. He certainly was familiar with the discoveries of psychoanalysis. And doing theatre for Frank Lloyd Wright at Taliesen he would probably have heard about the “rolls” – like player piano rolls – on which we store up our emotions, which Taliesen’s spiritual eminence grise, G. I. Gurdjieff, had theorized around work done on oneself in a theatre. But like any good student of Gurdjieff or Stanislavsky or Freud, Ray had come to his teachers with a question that was all his own, and had come away each time with a better version of his question: how can people — two people, or multitudes — love one another, to quote King of Kings? Ethnology was another stream that fed the films. After getting his training in theatre, Ray worked with Alan Lomax to record American folk artists, including jazz and blues musicians, and put them on the stage and on the radio in the 40s. He was doing the same thing when he filmed the rodeo world as background for the story of The Lusty Men, or later when he filmed juvenile delinquents and Eskimos and gypsies in color and Cinemascope. Thanks to this alchemy, the Harpur film is as true a confection as The Savage Innocents, which was filmed at the rim of the world and on English soundstages with professional actors playing Eskimos. That film was not a documentary, he said when asked to compare it to Nanook of the North, but a fairytale. 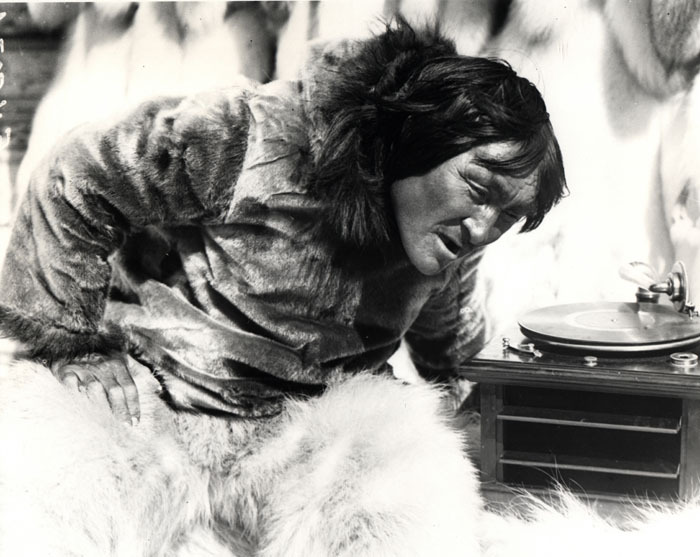 Had the conversation continued, he might have been obliged to add that his film was an ethnological fairytale, based on close observation of Eskimo mores, for Ray shared Flaherty’s vision and no doubt understood the ambiguities of Nanook — some of Nanook’s scenes are staged — as only someone else who had explored the possibilities of combining field work with mise-en-scene could. During the filming of Lightning Over Water Ray described to Wim Wenders how We Can’t Go Home Again’s young star Leslie Levinson informed him that she’d just met a pimp who offered her money they needed for the film if she’d turn a trick. (Another sequence shows her organizing a robbery for the same purpose.) As reported by Bernard Eisenschitz in his biography, Ray told Wenders: “I put I don’t know how many students covering the area where this sonofabitch was going to meet her, and the rendezvous didn’t take place. But the point is that, forty-five minutes after Leslie told me her story, cameras were in place and lights were rigged and we were shooting. I had let her tell me only the barest outline of the story, and she told me the rest of it on film. That’s the way a good deal of this film was made.” According to Susan Ray, the scene was filmed twice to get it right. The image we see is Nick with his back to the camera and Leslie with her face half hidden as he questions her. After a stormy discussion — jump-cutting over the failure of the pimp to turn up where Nick was waiting with his cameras — he encourages her to vamp a visitor who was dragooned into doing sound for the shoot and watches from offscreen as the timid novice inquires about her recent sordid experience. Sometimes it is Nick’s voice asking the questions, intercut with the voice of the visitor asking the same questions. A trade reviewer attributed this to poor sound recording, but it is a rather sophisticated effect, inspired by the partial loss of the original sound. Later Nick leads Leslie, who says she has taken some bad speed, into a little studio where he promises to help her “the only way I know how.” Munching a tomato, he listens as she recounts yet another scenario that throws her into the arms of a creep. Then she tells it again with an abbreviated version of the same mise-en-scene. The original version of this Terry Southernesque tale (“Someone told me you have the clap. Would you give it to me?”) may never have been filmed; what we see, twice, are staged re-enactments. Each telling ends with the actress getting pelted with tomatoes by Nick and her fellow students for being “sick,” as a student explains to the camera between repetitions while the weary crew takes a break. Suddenly becoming that scornful judge, Nick transforms the scene into a multi-screen extravaganza by yelling “Cut” with a slash of the hand across his throat, while one of the screens portrays him as the orchestrator of this violence, which the details from Picasso’s Guernica on the left-hand screens amplify with historical and mythical resonances, and a flash of Johnny Guitar: the callow gunman Turkey (Ben Cooper), who betrays Vienna (Joan Crawford) to the lynch mob and is killed anyway by Emma (Mercedes McCambridge). The shots lower-right of Ray directing the orchestra (the tomato-throwing students, Leslie, the four screens) channels the explosion of images to dramatize the violence that is part of Nick’s art — the violence Tom denounces in their first scene together, when he sees Nick almost hit Leslie with a dart thrown to relieve his anger over the footage he has been editing about the resistance to the Vietnam War. The myriad transactions that occur when a filmmaker directs an actor or actress are laid out as if on a blackboard in these scenes, whether the director is Nicholas Ray or Robert Bresson (to whom his French admirers often compared him). But despite the uncanny poetry of an elliptical night scene by a lake when the Man in Red (Nick’s color) becomes a Rabelaisian dirty old man, We Can’t Go Home Again is not an indictment of Nick as the wielder of the “male gaze,” which is only separated from the “female gaze” in bad filmmakers. That doesn’t let him off the hook — the indictment that will be made in the last scenes of the film cuts deeper than that. The multi-screen form of We Can’t Go Home Again was not an afterthought. Ray had planned to use multiple screens as a narrative device in 55 Days at Peking, his last commercial feature, before it was taken away from him by Samuel Bronston, and he had done little experiments with multiple screens both before and after 55 Days. For We Can’t Go Home he planned his shots with the format in mind and started screening them using multiple projectors as soon as he could during production. Standard equipment today in narrative filmmaking and televised news, multiple screens were certainly in the air during the psychedelic 60s and 70s: John Frankenheimer had used them in Grand Prix; Richard Fleischer had used them in The Boston Strangler; The Thomas Crown Affair, a heist film, had used them; Woodstock, a concert film, had used them; and simultaneously with the Harpur experiment, Brian DePalma, who had previously filmed the avant-garde Dionysus ’69 with split screens, was using them to create suspense in Sisters. Most of these diverse works had a common technical wellspring: films like Charles and Ray Eames’ “Think,” projected on six screens at the IBM Pavilion during Expo 1964, or a similar installation Ray appears to have seen at a Dutch exposition during the early years of living in Europe after 55 Days. All these films express the dream of panoptic vision — a demonic parody of divine omniscience — that has spawned our present-day culture of surveillance, turning public spaces in the UK, for example, into a multi-screen work being filmed 24/7 with 1.5 million closed-circuit video cameras. 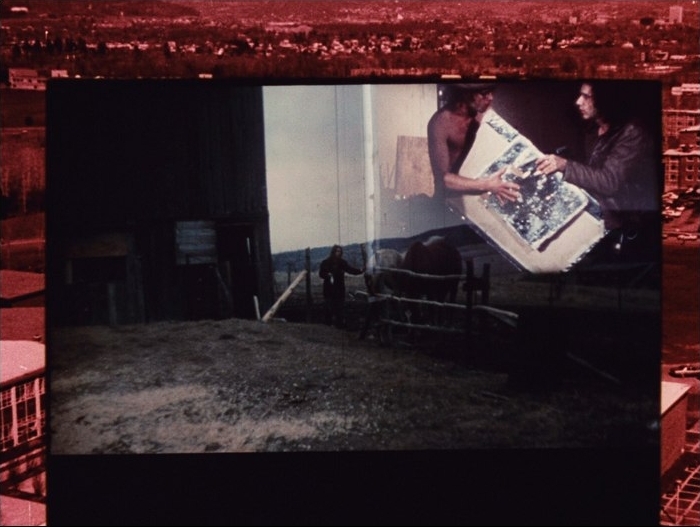 Ray’s use of four and sometimes five screens in We Can’t Go Home Again alludes to the panoptic dream, but only to subvert it, as he had already done in the films he made in the Fifties. The long scene in the police station at the beginning of Rebel Without a Cause, where the teenage characters played by James Dean, Natalie Wood and Sal Mineo are being questioned, is a crux for understanding Ray’s use of frames-within-the-frame in his Hollywood films. Murray Pomerance stresses that the station — cubicles separated by glass partitions — incorporates the panoptic nightmare that America in the 50s was already starting to dream. “[T]he adolescents we are watching are being watched by others, too. What we are watching when we watch Rebel Without a Cause is the act of watching, itself, a systematic and controlling generalized state of surveillance.” However, as Geoff Andrew notes, Ray uses the glass partitions “to create frames within a frame, simultaneously to separate the three strangers and to connect them.” The screens-within-the-screen in Rebel are part of a larger design — the web of social relations, the web of watchers — that separates people but also unites them, and this is the paradox of the multiple screens in Ray’s last film. Ray’s first and only Lacanian critic, John Hughes, makes a similar observation about On Dangerous Ground: the twisted tree form that divides Ida Lupino’s living-room joins her to Robert Ryan when their hands touch as they reach out and grasp it. Hughes calls the tree Nature; Ray told the Cahiers du cinema in the 50s that it was the kind of art piece that he had seen at Taliesen. A visual motif, nature made into an artifice, represents the characters’ separation and helps them overcome it. Lacan would call this language, our deepest alienation, and our salvation when we achieve authentic speech: what we see Tom struggling to do under Nick’s guidance in the scene where he shaves off his beard. In story terms, overcoming separation is an action, like Jim reaching out to Judy to pull her back from the cliff’s edge in Rebel. That is how Pomerance wants us to use Ray’s own term, “action,” to describe scenes or sequences in his films “in which some felt line of action is carried through, rounded out, concluded with pregnant meaning for the story and the sensibility of the film.” In Johnny Guitar, the “homely kitchen wall” that Hughes cites as an example of separation frames the nocturnal apparition of Vienna (Joan Crawford) in her wine-red nightgown when Johnny is drinking alone in the kitchen and neither of them can sleep. He has to tear her out of that frame before she can tell him that she still loves him. Their kiss concludes the action they have been accomplishing, in secret from those around them and from themselves, all through the film’s astonishing first act. But they are only free to leave together when the saloon, the cage Vienna has built for herself, burns down. This new cinematic language is built up from juxtapositions: Tom shaving his beard while news of Nixon’s re-election flashes on a small screen upper-right; actors in masks miming the interactions of the characters on the central screen, occasionally synchronized with their words, so that the masks seem to be speaking; another quick shot from Johnny Guitar of the Dancing Kid getting drilled through the head (by Emma again) when Leslie says that Nick must have a lot of money from working in Hollywood; or the scene with Nick and Dave in the editing room, where Ray indulges in his old habit of skewing a scene by introducing the viewpoints of characters (the two silent girls) who are oblique to it, while an irregular blob of solarized images floats above it like a balloon. In We Can’t Go Home Again the square frames that divide the image have begun to lose their definition, and they continue to overlap and meld as the film progresses, caught up in its steady unfolding. That rhythm, which is not the rhythm of a dramatic film, has been shaped by the principles of unconscious association, which we can read about in Freud’s The Interpretation of Dreams: the dream-weaving that creates patterns out of revolution and intimacy, big and small things, and keeps reshaping them until the final images of Tom dreaming his own film. 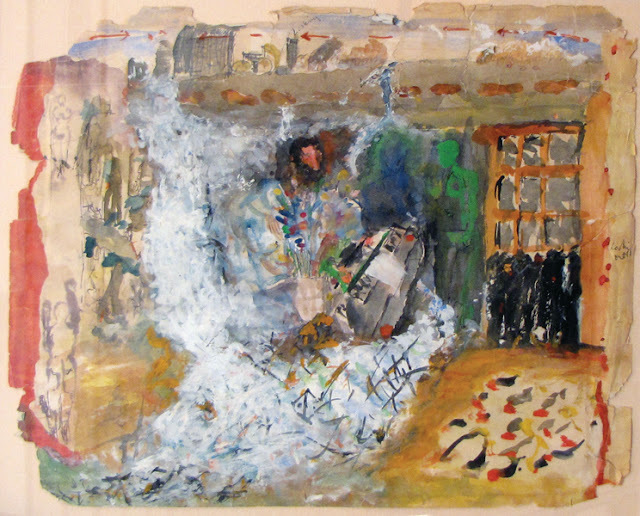 Ultimately the screens in We Can’t Go Home Again were going to melt together, as Ray showed Susan in a watercolor we see in Don’t Expect Too Much, her documentary about Ray’s obsessive pursuit of his vision of “mimage” (multiple image). This melting has already begun to happen in the snapshot of this constantly changing work that has now been restored, using as the copy-text the version made for Cannes in 1973. The internal screens are like manuscript illuminations during the film’s first half, becoming stained-glass windows in “the cathedral of the arts” — Ray’s kenning for “cinema” — when light starts pouring through them after Nick’s first death, as if these video-trafficked images were shining the light of lost days on the students’ graduation and subsequent attempts to “go home.” This is just one ravishing example of how the interplay of screens represents thought in action: freeing itself from the little boxes in which society has imprisoned it. There is even a replica of the ragged peephole James Dean uses to spy on his parents at the police station, which serves as a fifth screen in some sequences, its crude outline suggesting that, unlike the four rectilinear screens, it is letting us see through the black matte in which the square images are embedded. What is really behind the matte, we gradually realize, are still photographs of mostly urban landscapes at different times of day — the irregular opening is just an extra screen for 8mm images. This illusory knothole turns into a form with nothing behind it (in the editing room scene, for example) before being devoured by the flux of metamorphoses that affects all the forms in the film. The last time it appears, it is fleetingly ghosted-in over the head of Nick’s hanging body, like a nimbus. Exploring the frontier between self and other is what Ray means whenever he uses the deceptively innocuous word “communication” in interviews, masking, among other things, the predatory face of the practice, which is joyously celebrated in Anthony Quinn’s conversations with the prey he hunts in The Savage Innocents. That is what Tom accuses Nick of at the end of the film. After a touching scene where Tom and Richie invite him to come stay with them when he turns up on their doorstep (in reality this communal home was rented by Ray using his Harpur salary) after a faculty party that must have gone very badly, he seizes a camera and starts filming as soon as he enters the house. Before Tom explodes at this, Nick gives a student who’s leaving a hearty sendoff that brands him as a predator again, although the expression was coined by Woody Guthrie, with whom Ray had worked in radio: “Take it easy, but take it!” ­In They Live by Night Guthrie’s revolutionary slogan becomes a thief’s credo when T-Dub (J. C. Flippen) says it as he tells Bowie (Farley Granger) good-bye after the bank robbery that has set the boy on the road to an early death. In We Can’t Go Home Again, a film haunted through and through by the memory of Ray’s oeuvre, the echo of T-Dub’s farewell gives Nick’s bluff collegiality a hollow ring. At the same time Nick’s eye-patch is overlaid on the image of T-Dub’s volatile partner Chickamaw (Howard Da Silva) with his milk-white glass eye, and Chicamaw’s Cyclops is superimposed in our memory on Nick’s close-ups in the final scene, when he hangs himself and Richie and Leslie watch him die. The eye-patch also makes Nick like a camera, with its hungry eye. By a strange coincidence, while Ray was shooting these scenes, Orson Welles was shooting The Other Side of the Wind, which shows an old Hollywood director, Jake Hanaford (John Huston), playing God with the young actors in the avant-garde comeback film he is making, which he wrecks by seducing both his leading lady and his leading man. At the end of their respective films, Nick and Jake commit suicide. The death of classical cinema was happening in a hundred shapes during the 70s. We Can’t Go Home Again, The Other Side of the Wind and Ritwik Ghatak’s 1974 swansong, Reason, Debate and a Story, enact it by sacrificing the auteur on the altar of his last film. Nicholas Ray’s last days would be filmed for real, twice, in Nick’s Movie and Lightning Over Water, the two versions of the film Ray made with Wim Wenders. The hero of We Can’t Go Home Again dies three times, never for real, but played in various registers of poignant farce, from myth to naturalistic drama to metaphysical slapstick. The first time, Nick reenacts the death of a Binghampton poet who was run over hitch-hiking in a Santa Claus costume, but it is pieces of Nick’s own persona — and literal pieces of film — that drift to the ground in the aftermath of the comic-book collision. His students bury him in a gigantic coffin like Falstaff’s at the end of Chimes at Midnight (1967), associating the obliteration of Old Saint Nick with the death of Shakespeare’s tragicomic scapegoat — an indispensable bad influence on the young, to be discarded at the onset of maturity. The story of the professor and the students has the same tragic irony as Welles’ version of Shakespeare’s trilogy about the rise to power of Henry V, with Tom and eventually the other students repudiating Nick as Prince Hal repudiates his dangerous tutor. When Nick almost immediately returns from the dead, appearing first to Tom as an offscreen voice in the scene where he shaves his beard, he must have an action to perform, and that can only be to finish the film, even though his students have all graduated. So he tries a new ending: a scene from a Nick Ray film. Wandering into a barn on the wintry property where the students have their commune, he drunkenly weaves a noose in the hayloft, then thinks better of it and decides to sleep it off in the hay. The forces tearing this self-invented family apart are exposed in the ensuing scenes inside the house where he is invited to live with his students, but their shots and his reverse shots are superimposed to show that Nick is still part of the family, even though it no longer wants him around because of his obsessive need to finish the film. According to Bernard Eisenschitz this whole last act was filmed in early spring of 1973 as the production was winding down and Watergate was just starting up. 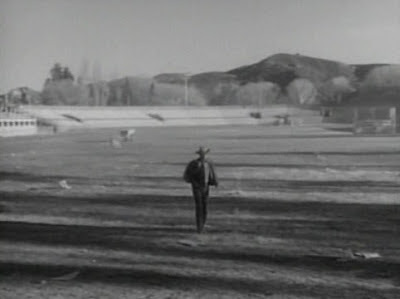 It concludes with the scene in the barn: “a moment directly echoing the deserted mansion sequence from Rebel Without a Cause,” says Eisenschitz, “in its tranquility and crepuscular lighting as much as in its content.” Why would Ray remake, after all these years, that nocturnal interlude from his signature film? And didn’t we already see Nick explode like a Christmas piñata full of celluloid, howling “Not now!” as if a poet’s will could defeat death? His final death by hanging again takes him by surprise, when he returns to the barn fearing that Tom, who has fled, will use the noose he left there, which in turn causes Leslie and Richie to come looking for both of them. This time Nick plays death as a Douglas Fairbanks stunt, using his falling weight to knock Richie off the ladder he was climbing to save him and into the hay with Leslie. This burlesque exercise of the director’s match-making prerogative is witnessed by Tom, who holds back, afraid to act — in an earlier scene, a long conversation with Nick filmed in one take during that same wintry spring, he had confessed that he was in love with Leslie. But now Nick can prophesy, speaking to them from beyond the grave — a separation that is negated by the voice that announces it: “I was interrupted.” This new conjuration of death is “Not now!” repeated in a finer tone, and in fact the idea that We Can’t Go Home Again was still not finished in 1973 may have helped keep death at bay, like Penelope’s suitors, for six more years, during which he became sober, continued to teach and make films with his students, and made his last film with Wenders. 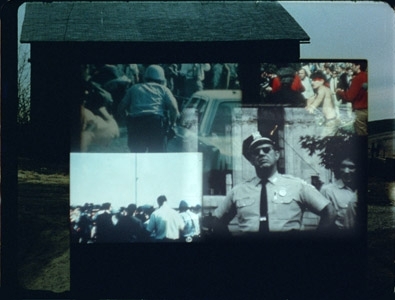 In 1973 We Can’t Go Home Again began with Tom’s voiceover, speaking as a college freshman who had seen these scenes of protest and police violence on tv before coming to Harpur, but the restored version substitutes Nick’s voice recalling his first-hand experience of the anti-war movement after returning to the States. So the film begins with Nick’s voiceover and ends with Tom dreaming the present, shown in the same kind of melting multi-screen imagery that began it: a film like a Moebius strip that passes the torch between generations. Almost four decades after We Can’t Go Home Again, we know what awaited the generation portrayed in the film, but it ends when the old world is dying and a new one is trying to be born: the moment when the artist’s work is done. - Cahiers du cinema nos. 5, “Paul et Virginie se sont mariees la nuit,” Jacques-Doniol Valcroze; 89, “Entretien avec Nicholas Ray,” Charles Bitsch; 27 “De l’imagination,” Jacques Rivette (translated in the Harvard Cahiers series vol. 1); 54 “D’une revolution,” Jacques Rivette; 112, “Le brigand bien aime,” Jean-Luc Godard; 112, “Les dents du diable,” Jean Douchet; 288, “La classe,” Bill Krohn; 310, “Nick Ray et la maison des images,” Serge Daney. - John Hughes, “Man Alone: Reflections on Nicholas Ray,” The Thousand Eyes, August 1974 (Issue #4). - Murray Pomerance, “The Hero in the China Seas,” in The Horse That Drank the Sky by Pomerance, and “Stark Performance” in Rebel Without a Cause: Approaches to a Maverick Masterwork, ed. by J. David Slocum. - Geoff Andrew, The Films of Nicholas Ray: The Poet of Nightfall. - I Was Interrupted: Nicholas Ray on Making Movies, ed. Susan Ray. This essay was enriched by input from Susan Ray, Tom Farrell, Andy Rector, Richie Bock, Charles Bornstein, Len Klady and two friends who are gone: John Hughes and Jean-Claude Biette.